You will have a lovely time visiting the Great Smoky Mountains this year. If you just got married or you are trying to rekindle your romance. Our cabin, on Morning Mist, is beyond beautiful. The smell of the woods and mountain air are intoxicating, and the amenities are wonderful; it is great to be able to get in the hot tub after a long hike or just to lounge around in it all day! It is easy to find and close to plenty of stuff without being too close and spoiling your nature trip.Trolley stop 2 blocks away, to downtown. You and walk to the arts and craft community. The cabin also has an updated modern feeling to it. You will love this cabin and want to return as soon as possible. We are located right near the new Rocky Top Sports Complex!! Short walk to trolley $1.00 ride round trip! Fully furnished kitchen PLUS things that make your stay easier! Blow dryer in bathroom and PLUSH towels! Dollywood, New Ripley's Aquarium, Smokey Mountain National Park, Ober Gatlinburg Skiing, Ice Skating, Water Rafting, Water Park, Go-carts, Quaint Gatlinburg Shopping & Wonderful Outlet Malls, Great Restaurants, Music & Comedy Shows Galore, Dollywood's New Splash Country, Gatlinburg Community Center. The cabin is perfect for two adults. We found it clean and enjoyed the peace and quiet of the location. Thank you to the Manager & prompt response to our reservation request. We are already considering when we can visit again! My husband and I had a wonderful stay at this cozy cabin for our honeymoon. The cabin was very clean and in a great location! It is not far from restaurants or grocery store nor is it a far drive to the national park, but it was also secluded enough that we had peace and quiet every day. We enjoyed soaking in the hot tub after a long hike and relaxing by the fireplace. 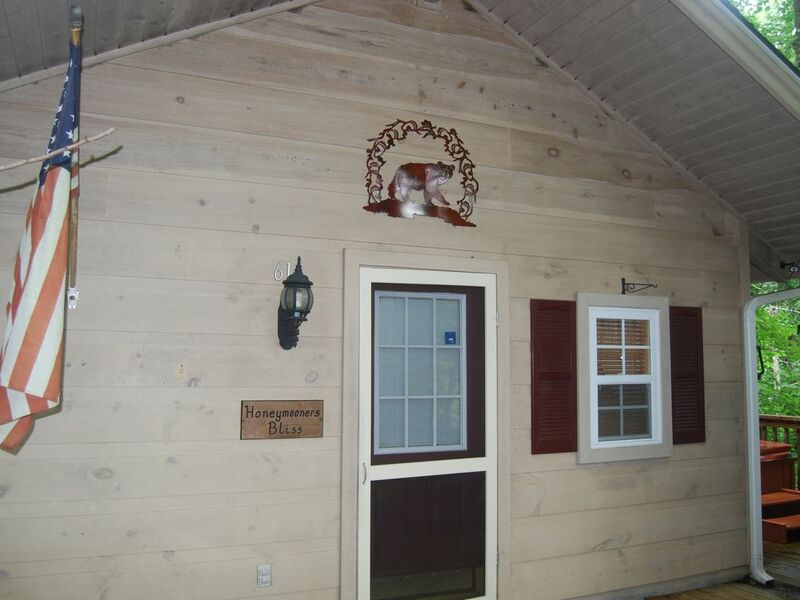 We highly recommend this property to anyone visiting the Gatlinburg area! Great getaway at a super nice cabin! This was the perfect cabin for our anniversary. It's just the right size for two people, secluded yet still close to attractions. It was clean and comfortable, we'd definitely recommend it for couples. There are a lot of local shops and quaint little restaurants close by for folks who don't care for the hustle and bustle of downtown Gatlinburg. The parking is tight, so we don't recommend big vehicles. We struggled to get our Toyota Tacoma parked in the steep and awkward parking spot. Great location and very clean ! Loved our honeymoon at this cabin, the hot tub was great to use after a long day of hiking. The only reason I give this 4 stars is bc when you filled up the jacuzzi the water went cold before it could even reach half way up so it was not usable. Otherwise we loved our stay, very quiet neighborhood but close drive to town. You will have a lovely time visiting the Great Smoky Mountains this year. If you are on your Honeymoon or if you want to relive your honeymoon! Our cabin, on Morning Mist, is beyond beautiful. The smell of the woods and mountain air are intoxicating, and the amenities are wonderful; it is great to be able to get in the hot tub after a long hike or lay around all day. It is easy to find and close to plenty of stuff without being too close and spoiling your nature trip. The cabin also has an updated modern feeling to it. You will love this cabin and want to return as soon as possible.